The New Zealand Maori's centenary celebrations went off with a bang on Wednesday when Martin Johnson's England became the latest side to learn about their pace and power the hard way. Declan Kidney's Ireland suffered a similar defeat at the hands of the Maori this month and with these upsets in mind, we take a look back at some of the most famous days in the Maori's illustrious history in our latest Scrum Seven. The Maori story began in 1910 when, in part to counter the number of players defecting to rugby league, a tour to Australia was proposed with the backing of the New South Wales Rugby Union. The architect of the tour was Bay of Plenty's Ned Parata and it was duly undertaken in June and July 1910. While both games against New South Wales were lost the tourists were able to pick up morale-boosting wins over Queensland, Victoria and the American Universities. 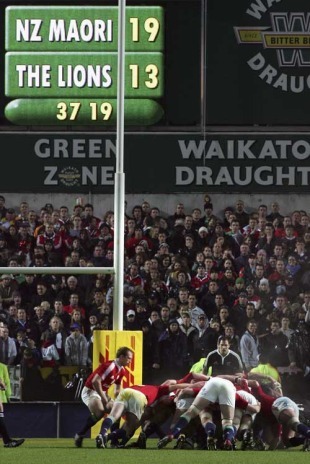 The 2005 British & Irish Lions had a tough time in New Zealand, thrashed 3-0 in the Test series against the All Blacks with their skipper, Brian O'Driscoll, ruled out by a spear tackle seconds into the opener. The warning signs had been there for the tourists, and not just in coach Clive Woodward's bloated squad and media circus orchestrated by spin doctor Alastair Campbell. The third match of the tour was the 'fourth Test' against the Maori at Waikato Stadium. A game of brooding power, the Lions became victims of a fired-up Maori side. O'Driscoll scored a try for the tourists but his effort was matched by Leon MacDonald, with Luke McAlister, soon to make his All Black bow in the final Test, winning the game from the kicking tee. The 1926-27 Maori side is widely regarded as the finest. Despite difficult beginnings, with star fullback George Nepia left at home in confusing circumstances, their seven month tour of Australia, Ceylon, France, Wales and Canada brought 29 victories, seven losses and two draws. The highlight came in Colombes when, in bitterly cold conditions, they triumphed 12-3 over France. Wattie Barclay scored twice for the tourists, while Billy Rika and Alby Flawasser completed the victory in front of 30,000 home fans. Between 1946 and 1958 the Maori defeated the Wallabies on three occasions, beginning with this clean sheet in Hamilton. Led by scrum-half 'Doc' Paewai, who scored one of four tries, the Maori won this game at a canter despite it being classed as an official Test by the tourists. Centre Peter Smith scored twice while flanker John Marriner and fly-half Jack Gardiner also breached the tourists' defence. The next victory for the Maori over the men in gold came in 1949 in Sydney, as part of a drawn three Test series, following the controversial omission of Maori players from the All Black squad to tour South Africa. England's ferociously tough, not to mention over-ambitious, 1998 'Tour of Hell' ended more international careers than it started. Test defeats against Australia (a 76-0 hammering in Brisbane), the All Blacks (64-22 in Dunedin and 40-10 in Auckland) and the Springboks (18-0 in Cape Town) left Clive Woodward's young charges with a balance sheet of 198 points conceded and 32 scored. Sandwiched in-between was a choice meeting with the Maori in Rotorua, with the hosts midway through a 24-match winning streak that would eventually claim 12 international sides. Spencer Brown and skipper-for-the-day Tony Diprose scored the England tries with Tim Stimpson converting both. Also among the England starting XV were Lewis Moody, Phil Greening and Alex King. The Maori scored nine tries, by Norm Berryman (2), Adrian Cashmore, Roger Randle, Tony Marsh, Rhys Duggan, Tony Brown, Dallas Seymour and Jim Coe. Cashmore converted seven and kicked a penalty to collect 22 points altogether. England got a measure of revenge in 2003 when Phil Vickery led them to a 23-9 win. With England safely put in their place, the Maori took their show on the road later in the year. Their destination was Edinburgh and more specifically Murrayfield, where they took on a Scotland side in the grip of a demoralising six-Test losing streak, including a summer tour loss to Fiji. Scrum-half Bryan Redpath led the home side for the first time in the game, which was won comfortably by the 'streetwise' Maori, who angered Scotland's legendary coach Jim Telfer. "Some of the things that went off close to the referee and touch judges didn't hearten me. They play the game differently in the southern hemisphere," he said. On the same day that the full England side was branded "nothing more than a rabble, a rugby equivalent of a lynch mob, intent on playing All Blacks off the ball and angering them into mistakes and indiscretions" by Australian columnist Spiro Zavos following an undisciplined Test series against the All Blacks, a rematch of sorts took place in Calgary. The Maori had accepted the invitation to join England, the USA and Canada in the second Churchill Cup. They dispatched the USA 69-31 in the semi-final but were made to work hard for the title. Two tries in as many minutes from Caleb Ralph and Glen Jackson hauled the Maori back into the contest and it was Hosea Gear, scorer of a hat-trick against England this week, who sealed the deal with a try deep into extra time.